We are so pumped that the new season of The Bachelor premiers tonight. Prince Farming may have the best season yet! A group of us always love getting together on Monday nights to watch the show, eat some yummy food, and enjoy a glass (or two) of Moscato. We thought we would spice things up a bit this year by adding a Bachelor Bingo game! Since we are already feeling the love, we thought we would share this super fun game with you. 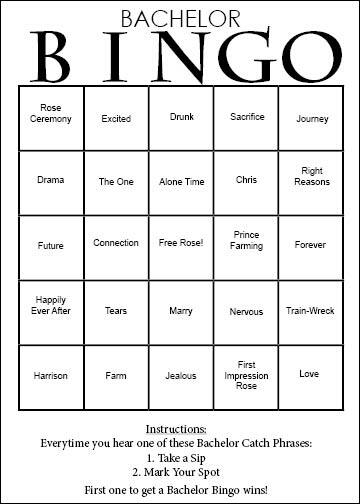 There are 5 different Bingo cards below filled with our favorite “Bachelor Lingo” that you can download and pass at to all of your friends. We hope y’all enjoy this season and this game as much as we do.